I think I know why customer service can be so much nicer in north-america, than the service we get here in France. The first reason is the one I mentioned here, telling about my friend’s misadventures with Cyrillus : sales and service is something noble in anglo-saxon protestant countries, whereas it is considered a low-key-not-worthy job in our catholic cultured France. The second reason, after a two week holiday in Canada this summer, is now more obvious to me : Money ! In the States and Canada, waiters and shop assistants’ salary is based on one thing: the tip that you are going to leave them ! 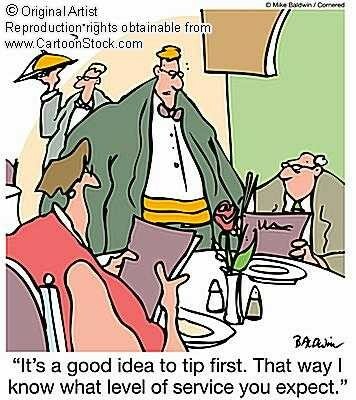 Service is NOT included in your bill, and it is common to tip around 10-15% of the total, to reward your waiter or waitress of his/her service. If you are happy with what you got, and you are generous, you can tip more of course, up to 20% or more ! Whereas in France, service is included in the bill and we usually do NOT give tips. Thus our waiters do not care at all if they are obnoxious or nice with us, since they will not get paid more ! My conclusion is: maybe I will start to be more generous with my french waiter next time, and give more than a nice smile and thanks to the waitress who will be nice to me. And maybe the top tip will get me the tip top service ?